Seventh Doctor to Play Bilbo Baggins? A source close to Sylvester McCoy suggests that he might be trading in the TARDIS for a hobbit hole. Frodo Baggins? Bah! He's a latecomer to the story of the One Ring. Let's face it, all he did was carry it across hundreds of miles of hostile terrain and threw it into the heart of a raging volcano. Ok, that's actually quite impressive, but the story of how the ring came to be in the Shire in the first place is also very important, and that's the story Bilbo Baggins. And who better to play such an important character in the upcoming movie adaptation of The Hobbit than a former Time Lord? 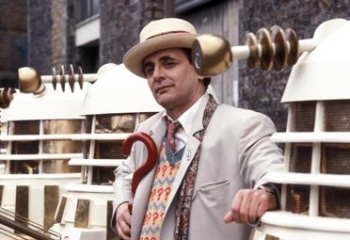 Rumors are circulating that Sylvester McCoy, who played the seventh incarnation of the Doctor, has secured "the second biggest lead" in the film, which is assumed to be Bilbo, as McCoy was a close contender for the part during the casting of the Lord of the Rings movies. The rumors - which McCoy's agent would neither confirm nor deny - apparently came from sources close to the actor, and if true would mean that McCoy would star opposite Ian McKellen and Andy Serkis. It may be some time before we see anyone taking on the role however, as the movie has been dogged by delays and problems, the most recent of which is the departure of Guillermo del Toro from the director's chair, and severe monetary troubles at MGM. It is rumored that Lord of the Rings director Peter Jackson is in talks to take over from del Toro, but nothing official has yet been announced.